Visitors to the Christmas grottos at Squire’s Garden Centres across Surrey, Sussex and Middlesex not only met the man from the North Pole, but also shared the true spirit of Christmas by helping to raise an amazing £19,480.55 in support of a range of local charities. 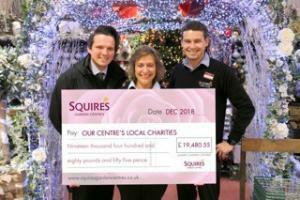 All 15 Squire’s garden centres participated in the seasonal fundraising campaign. In addition, centres that hosted Santa’s grotto donated a proportion of ticket sales revenue to a chosen local charity. The excited visitors also donated cash as they made Christmas wishes in the special wishing wells and fountains, adding to the collection pots at each Squire’s centre. The funds raised will provide vital support to a diverse mix of local charities, supporting groups and projects needing help in the community, including: Olive Tree Cancer Support Centre, Phyllis Tuckwell Hospice Care, The Royal Star & Garter Homes, Woking & Sam Beare Hospice, Macmillan Cancer Support, The Samson Centre for MS, and West Horsley & Bookham Riding For the Disabled.